This article was printed from http://propel.mdat.org/category/choosing-a-ministry/. Most of the correspondence that comes to AskaMissionary.com is from prospective missionaries. Some are just trying to find out what missionaries go through. How do they know they’re supposed to do this? What do they later wish they’d known from the start? How did they prepare? What kind of training do missionaries need? What would keep someone from succeeding? Yes: there’s a place for you in God’s global mission. Yes, people like you have found jobs, and agencies, and teams of supporters to stand with them. Yes, the things you do now are needed somewhere else. You can probably find national partners to link arms with who deeply value the contribution you can bring (and bring out in them). Yet anyone with much mission experience tends to discover something more. Serving in mission often means laying down your own agenda. It means doing things you’ve never done before and adapting to circumstances beyond prediction or control. Yes, you may use that degree (and discover what you really need are the persistence and problem-solving skills you picked up in getting it). Yes, you will discover that God does not waste your life experience (and also lead you down paths you never expected). Yes, there’s a place in missions for people like you… and people like me, too. We finalized the name for the new internet resource center for aspiring missionaries. Can I have a drum roll please? The name of the website will be… PreparingToGo.com. Although we tentatively used that domain name to refer to the project for awhile, we did not know if it would go over well with the intended audience. On our quest to make a final name selection, we brainstormed 200+ alternate names, eliminated all but five, and made a survey. Fifty aspiring missionaries gave us their input. The result? PreparingToGo.com emerged as the leader. We think it is a good name to work with—a solid name that relates well to the content of the website, has few negatives, and is easy to remember and spell. A good name only goes so far though. Ultimately the content on the website supersedes the name. We are happy to report progress on the content the front! In May, an intern from JBU edited down the footage from several missionary interviews and our pilot run of an organization headquarter tour. In July, we set up the ability to post the videos on PreparingToGo.com. That brings us to beta version 0.6 for the website! Hurray for progress! You can watch these first samples at http://PreparingToGo.com/videos/ . Or watch them via our YouTube channel. If you have a YouTube account please subscribe to the channel and add us as a friend. Although we have made progress, we also encountered a few setbacks. Unable to figure out a satisfactory method to get around closed country issues for the mission field reports we envisioned, we decided to put production of these video clips on hold indefinitely. Also, our week long mission trip to produce a series of mission agency headquarter tours fell through. Between staff training, travel, and office remodeling projects, summer is not a good time to schedule these tours for the mission agencies. In fact, it may be pretty near impossible to coordinate producing a series of tours in a one week time frame. Lining up the schedules of multiple organizations is tricky! We’re not abandoning the idea though. We will just have to work out a different way of accomplishing the goal. The next few pieces of the website we are working on are a directory of mission organizations, a logo for the website, and producing more video clips. Content. Content. Content! For those of us who’ve heard the Great Commission’s call and are being led into full-time mission work, the ease of getting plugged in varies. For some, the perfect opportunity presents itself in such a way that to say “no” would be like Jonah not going to Nineveh when he was so clearly instructed to do so. Other people possess clarity of calling but can’t seem to get plugged in. Reasons for these circumstances vary, from the right opportunity not being out there to, I believe, God keeping some back — who truly desire to go — in order to mobilize. My wife and I have experienced both of the above scenarios. We were clearly led to be a part of Mission Data International, and we acted on that. Before this, however, I agonized (and still do) over the lack of opportunities created and offered by mission agencies for visual artists, opportunities other than graphic design, illustration and photography. It seems as though I just don’t fit into the whole missions thing. My own interest lies with the tactile arts of painting, sculpture and ceramics. Very few openings with established sending organizations exist for people who feel led to serve in long-term missions while using their talent as a potter or printmaker. Organizations like PIONEERS give teams and individuals the flexibility to create their own strategies, employing a variety of skillsets in order to create dynamic church planting efforts. Last year I exchanged emails with a PIONEERS team eager to have an artist serving with them in Southeast Asia. This is encouraging and gives me hope things are moving in the right direction. However, job descriptions are often lacking in these circumstances. Someone trying to find their place in such instances must possess an entrepreneurial bent to get involved this way. Not all people led to be missionaries are such self-starters. Operation Mobilization, is devoted to getting visual artists into missions. In this way artists who want to use their gifts overseas aren’t the ones coming up with the opportunities. Within the current American mission structure, efforts such as Arts Link are a must. I can imagine some people saying that if you are led to serve overseas, every effort should be made to participate in any way possible. There are needs, all kinds of needs all of the time, among mission projects all over the world. Pious work is pious work, right? I met a missionary family some years back who arrived in Spain expecting to oversee a camp. When they got to the camp the current director decided he wasn’t ready to retire just yet. The family was reassigned to a nearby church plant, where they felt entirely out of place. After seven years of service at this awkward post, the family learned the camp director would now retire, and they finally took their post at the camp. Some will argue this was part of God’s bigger plan. Perhaps the family wasn’t ready for certain challenges presented by the camp administration; maybe God was testing their faithfulness as he did with Abraham and Isaac. While time may give us a better idea of the reasons behind certain trials, we can’t always know the meaning of things like these in the moment. And regardless, such arguments don’t allow us to forgo making appropriate plans before we build our tower — or go to an unreached people group with the Gospel. Serving for the sake of serving is commendable and sacrificial, but it’s also poor strategy and a waste of God-given resources. Scripture tells us that different members of the Body are given different talents. An eye can’t do what the hand is able to; the Body must work together. So how much patience is required on the part of the missionary candidate? How long should a person planning to go into full-time missions work search and wait for the perfect opportunity? Or is not finding the perfect and most strategic opportunity the same as a closed door? I’ve been reminded a few times in the last month of how one person cannot rightly judge the circumstances of another. Seeking counsel is Biblical and important, but wise counsel will understand that they aren’t the ones walking in your shoes. No one else can tell you how the Spirit of God might be leading you. Instead of closing with a true yet cliched proverb, I want to encourage readers who find themselves on the outside (per se) to press on. Oops, I guess that’s a bit of a platitude as well. Still, press on! Press on by supporting existing programs that focus on your calling, even if they aren’t exactly what you’d like to be a part of. Brainstorm new ideas with people of similar passion and research what it would take to get them going. Stay in touch with people who share your ideas. Your work will not be vain. Propel: Do you remember when and how this passion, this interest for world missions began for you? Eddie: Rhonda and I felt God’s call on our lives at First Baptist Church McAlester, Oklahoma, in June 2002. It was during a missions festival we attended just a month after my first mission trip to Malawi, Africa. I knew that this was my purpose in life. God confirmed it by calling us both at the same time. P: In what ways were you involved in missions this past year? 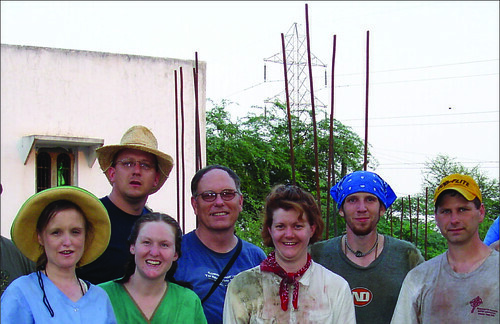 E: I went to India with the Washington-Madison Baptist Association last May to help with Tsunami relief work. We went to help build a “vocational/lifestyle rehabilitation” in Vidjayawada. I have taken the IMB’s Thessalonica training course taught by the author and IMB facilitator Bruce Carlton. E: My wife and I are currently and persistently working towards becoming debt-free so that we may pursue our calling to serve God wherever he sends us. P: What would help you overcome the obstacle, the debt? E: An outpouring of God’s abundant grace in providing a way for this debt to go away! P: How has God used other people or resources to help you along as you continue to pursue missions? E: We often find ourselves discouraged because we don’t see things happening fast enough. I personally get dejected at times. However, when this happens and never without fail God puts someone in our path to bring missions to the forefront of our thinking. I can be in a poor frame of mind and will come home to find that I have received emails from many friends in four different continents, eight different countries. This is my silent confirmation from God. He has called us to this undertaking. Why should I doubt that he will not provide a way to make it happen? I must remember to remain in Him and we will receive these things in His time, not ours. E: I fully expect to be on the field. If not we will continue to serve locally, wherever He leads. P: You’re a member of a Southern Baptist Church, correct? How has this influenced your missions vision for good or bad? Or has it influenced it at all? I’m interested to know your thoughts on the IMB, the way they function and the work they are currently involved in abroad, perhaps in particular where you see yourself serving with them. E: As we are Southern Baptists, we will apply as missionaries to the IMB. If for some reason the IMB doesn’t share in our being sent, then we will simply find another sending agency. We believe God has called us and that He is currently preparing us. He will send us out. I believe that the The Cooperative Program that is currently in place is a wonderful way for all churches in the Southern Baptist Convention to participate in God’s plan for missions. I also can appreciate how IMB missionaries are allowed to spend all their time serving in the field. Most other sending agencies require that their personel spend up to half of their time raising their own support. I think that would be most distracting and disheartening as I can see that this might require a lot of time and energy that could be spent on assignment. It is our prayer that God would use us wherever and however He sees fit.